Leda Beluche interviews me for one of her Girlie Vegan videos on YouTube. John Greenewald spoke on " Inside The Black Vault: A 2 Decade Journey into the Declassified World of Government Secrecy," referring to his website that is the repository of vast numbers UFO-related documents, many of them released by government agencies. He described how he first began requesting UFO-related documents from government agencies twenty years ago, when he was just fifteen! Greenewald argued that blacked-out sections of released NSA documents pertaining to UFO reports indicate that the government continued to investigate UFOs long after Project Bluebook was closed. I was thinking, "never attribute to malice what can be explained by incompetence or over-zealousness." He noted that 100% of released CIA UFO-related documents were newspaper stories, from all around the world. Some investigation - a CIA newspaper clipping service! In any case, you will find far more interesting UFO stuff in The Black Vault than in Hangar 1. Nick Pope, who worked for the British Ministry of Defence for 21 years, has built a career as a major UFOlogist based on the fact that for three of those 21 years, he worked on the MOD's UFO desk. His talk was titled "Disclosure: Who, What, Where, When, Why?" In the UFO community, "Disclosure" is an expected event that is viewed much the same as the evangelical Christians see "The Second Coming": it's inevitable, it's coming soon, it will change the world - but when? Pope noted that one factor discouraging Disclosure is that the government would in essence be admitting, "We've lied about this for over seventy years." He also noted that governments "over-classify like crazy" and that "redaction" is typically arbitrary and somewhat capricious, points relevant to my comments on Greenewald's talk above. Pope spoke of many hypotheticals concerning so-called "Disclosure." He even called his own talk "speculative," and I fully concur. He talked a bit about Rendle-sham (probably his top case), showing us a sketch by Jim Penniston of the supposed "craft," and promoting his forthcoming book, The Halt Perspective. There was a panel on the Alien Abduction Agenda featuring Barbara Lamb, Dr. David Jacobs, Dr. Joe Lewels, moderated by abductionist Yvonne Smith. This panel really brought out the differences between Jacobs' apocalyptic vision, and the others' view of the aliens as Sweetness and Light. Jacobs said he wished they could have this nice, happy, harmonious abduction community, but the "reality" of the aliens' agenda is shocking. Lewels said "thank God" that the alien hybrids are here, and not a minute too soon. We are all "hybrids" created by aliens long ago. Receiving new hybrids into our midst is like a "software upgrade." It will make humans less violent, and more loving. Jacobs said that if you think you are an alien hybrid, you almost certainly are not. If somebody cannot easily read your mind, then they are not a hybrid. This invasion of "hubrids" is the most important thing that has ever happened to humanity. Smith asked the audience, "How many feel an urgency," that something is coming soon (like the New Age or something). A lot of them did. For the past few years, Ben Hansen, formerly the star of the show Fact or Faked? on the SyFy Channel, has been representing a vendor of very expensive night vision optics On Thursday evening, Ben held a night vision skywatch, as he did in several previous years. Unfortunately, the sky was mostly cloudy, although the moon and Orion peeked through the clouds briefly. Ben's commentary about what we are seeing has always seemed correct to me; he does not hype airplanes or satellites as UFOs. I brought my portable telescope, but there wasn't much to see. Some news crew that had been filming Hansen saw me with my telescope, and they filmed me, too. That video might have been shown somewhere, I have no idea where. Yours truly with the Big Guy, Ben Hansen. As I have written elsewhere, the use of expensive night vision optics (like, $6,000 each) is becoming a popular thing in UFOlogy. What people don't realize is that these image intensifiers and IR viewers were not made for astronomy, and are not suitable for viewing objects in the skies. No astronomer uses these devices. They are designed for surveillance and military applications, to spot people hiding in the bushes. UFO enthusiasts love night vision devices because of their frequent false positives. Every bird, airplane, satellite, etc. that crosses your field of view is magnified to a big white (or maybe green) blob. What you gain in sensitivity, you lose in resolution. If you think that UFOs are flying overhead, unseen, you should buy a really good pair of binoculars to look for them. The next day Ben and I spoke at some length about astronomy. He is interested in adding telescope viewing of astronomical objects to the occasional skywatches he arranges. He isn't familiar with the features of today's high-end amateur telescopes, and we discussed getting started using them. I told him how, as a member of the San Diego Astronomy Association, we hold frequent public observing sessions, and invited him to join us. If Mr. A's reported experience were physically real, it would show the existence of alien flying vehicles in our environment. Attempts to establish the reality of the event revealed many inconsistencies and incongruities in the case, a number of which are described in this report. Developments subsequent to the field investigation have not altered the initial conclusion that this case does not offer probative information regarding inconventional craft. Rutkowski also spoke about the famous Yukon, Canada sightings of December 11, 1996, which until recently was one of the best cases in Canada, or anywhere else. Then Ted Molczan (another Canadian) demonstrated that this sighting coincides almost perfectly with the fiery re-entry of the second stage of the Russian rocket that launched the Cosmos 2335 satellite earlier that day. I almost felt sorry for Rutkowski, having to insert caveats into his discussion of this once-solid case. He seemed to be saying that some of the observers saw the rocket re-entry and reported it, while others, whose descriptions were much more dramatic, may have seen something else. He apparently could not make up his mind about this question. Rutkowski posted to Facebook "Ten things I have learned so far at the International UFO Congress:". One of them was, "Robert Sheaffer is the devil incarnate. At least that's what I'm told by people who saw me talking to him." MUFON's Director of Research Robert Powell gave "A Detailed Analysis of an Unidentified Anomalous Phenomenon Captured in a Homeland Security IR Video." On April 25, 2013 a U.S. Customs and Border Protection aircraft flying over Ahuadilla, Puerto Rico captured an object on infrared video that Powell said was the best UFO video he had ever seen. Working as part of a group calling itself the Scientific Coalition for UFOlogy, they have produced a 161-page analysis purporting to show that the object appears to possess a technology unknown on earth. The most interesting part of their report is the claim that the object, moving at close to 100 mph, went into the water and continued at that same speed underwater for several seconds when it emerged. Their report, and the IR video, are found on the SCU website. During the Q&A period, I noted that there is a different group called the Puerto Rico Research Review (PRRR), consisting of many of the same people who worked on the Roswell Slides Research Group, that has been analyzing that same video, and coming to quite a different conclusion. (Most importantly, the object never enters the water. It is closer to the camera than the SCU estimates, and not traveling as fast. The optical aspects of an object seen in thermal infrared are quite different than if seen in visible light.) Because the PRRR group has been working only from the YouTube version of the Aguadilla IR UFO video, which is lower resolution, I asked Powell if he would be willing share the higher-resolution video that he has been working with. He was. After his talk, I obtained a copy from him, and shared it with the PRRR group. (Continuing from the last posting) Alejandro Rojas was the Master of Ceremonies for the Congress, introducing the speakers and making announcements. He spoke about several interesting but implausible "Strange Alien Encounters," in many different countries: the U.S., the UK, Italy, Chile, Poland, Japan, and others. The famous Kelly-Hopkinsville "goblin encounters" in Kentucky, in 1955. An alleged encounter with extraterrestrials by a maintenance man on the estate of Lord Mountbatten (Prince Philip's uncle) in 1955. Desmond Leslie was Mountbatten's friend, who related further ET contact claims by this maintenance man. (It wasn't mentioned that Leslie was a close associate of and co-author with George Adamski). Perhaps the most interesting story was that of Kirsan Ilyumzhinov, who served as president of the Republic of Kalmykia for 17 years and for 20 years as the head of the World Chess Federation. He claims to have been abducted by aliens, and even claims that the game of chess was invented by space aliens. Longtime UFO abductionist Barbara Lamb's talk was titled "Meet the Hybrids - ET Ambassadors on Earth." She explained that when she goes to UFO conferences (she goes to pretty much all of them), she meets women (mostly) who claim to be alien "hybrids" born to earth women. Some claim to have Reptilian paternal ancestry, while others' fathers are Mantis beings. She has a completely different view of the alleged hybrid invasion than does Jacobs, who sees it as our greatest existential threat - she sees it as all Sweetness and Light. She actually said that the aliens' whole reason for being here on earth "is to serve humanity." Perhaps she is not familiar with the episode of the Twilight Zone in which the alien comes to earth with a book titled "to serve man" - and everyone is delighted until it's discovered that this is a cookbook. In any case, she quickly added, "in a beneficial way." In her rambling, unfocused talk, Lamb asserted "we are all one," aliens and earthlings alike. She called up her six "hybrids" to speak, one by one. Five of the six are women. As the first one rambled on, taking far more than one-sixth of the remaining time, it occurred to me that Barbara Lamb seemed unaware of the Second Law of UFOlogy: Whenever a New Age "experiencer" has an opportunity to speak to an audience about her paranormal adventures, she will continue to do so until someone loops a cane around her neck and pulls her offstage. These various Hybrids claimed to be 5th dimensional beings, and spoke about their hybrid children aboard that UFO. They are here to "raise the frequency" of earth, as well as to help the animals. Dr. Joe Lewels has a PhD in journalism, and is a certified hypnotherapist. His subject was "Forbidden Science - UFOs and Religion." He asserts that UFOs are the "missing link" for understanding the miracles of the Bible. All that talk about Ezekiel's Chariot and the Burning Bush and such are just "Biblical terms for UFOs." He concluded that "UFOs inspire religious beliefs." Amen, brother! David Hatcher Childress is well-known as the co-star of Ancient Aliens on the History Channel, and styles himself as "the real life Indiana Jones." He spoke on "Ancient Aliens and Megalithic Construction." He explained how all of these ancient megalithic sites are so wonderful that they could have only been built by aliens. Even after his talk, Childress showed himself to be a veritable dynamo of energy as he held the attention of assembled crowds at his literature table and elsewhere, dispensing off-the-cuff wisdom about ancient aliens and such. Childress at his literature table, taking the Name of Science in vain. Animated and energetic, he wows the assembled crowd. Mirror, Mirror on the Wall, who has the largest UFO conference of them all? According to the Guiness Book of World Records in 2015, the International UFO Congress near Phoenix is supposed to be the largest. Its auditorium, sometimes filled or nearly so, seats 1200 people. Add in a few hundred more milling about, and you've got maybe 1500 people attending. But according to press reports, last years Contact in the Desert UFO Conference drew over 2,000 people to the Mojave Desert at the end of May. What is their draw? It certainly was not the amenities, with much of the conference taking place outdoors in the summer desert heat, or under tents. Probably it's because of the "even more fringe" orientation, including the likes of David Wilcock, Georgio Tsoukalos, and even Erich von Daniken himself. A scene from "Contact in the Desert," 2015. 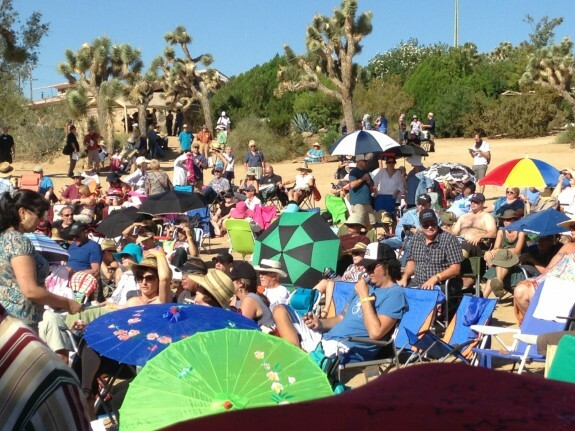 Attendees enjoying the nice, warm 100-degree desert summer sun. The very first speaker was Samuel Maranto, MUFON's Illinois State Director, to speak about "Mass Sightings" in his state. Unfortunately, most of his photos and videos only showed featureless 'lights in the sky,' which could have been a lot of things, like lighted balloons (which suggestion he rejected as "complete and utter nonsense"). I did not realize that when the celebrated early morning sightings occurred in southern Illinois on January 5, 2000, the state was already having a decent-sized flap of UFO sightings, and sightings occurred in that same area the previous evening. So people were well-primed to see unidentified objects. He also spoke about the now-famous 2006 UFO sighting at O'Hare Field Gate C17 (and apparently nowhere else). There are no photos of it, and it did not show up on radar. However, he showed a photo that depicted a round, fuzzy cloud, and said this was what the observers said it looked like. I spoke with Sam quite a bit afterward. He is a very friendly guy, and is not dogmatic. Paul Davids is a writer and producer of movies and TV shows. He was the producer and co-writer of the Showtime film Roswell in 1993. He spoke on "Marilyn Monroe, the CIA, and UFOs." He made much of the FBI Hottel Memo that talks about an alleged UFO crash, not bothering to explain how it has been shown to be just a re-hash of the well-known (and bogus) claim of Silas Newton.As for MM, she was killed by the same people who killed JFK the following year. During the evening film festival, Davids presented his 96 minute documentary movie, Marilyn Monroe Declassified. I saw part of the movie, and found it entertaining, just like his talk, but based on gossip and conjecture. I also had some interesting conversations later with Paul. He says his interest in UFOs began when he and his family had a Daylight Disc sighting near Los Angeles in 1987. Nick Redfern, who has written three books about the MIB in the past few years, spoke on "Men In Black: History and Mystery." He went into the well-known history of the Men in Black: Albert K. Bender, Gray Barker, John Keel, Tim Beckley. Brad Steiger, said Redfern, reported an MIB encounter. Since Steiger confessed to me when we met, decades ago, that nothing he wrote should be taken seriously, he knows it's nonsense, I doubt that Steiger's "MIB encounter" actually happened. Redfern suggested that the MIB could be (in addition to government agents) ETs, Time Travelers, Demons, or perhaps related to Vampires. He also suggested that in "They Knew Too Much About Flying Saucers," Gray Barker tried to understand Bender's MIB as best he could. When I had a chance to speak with him later, I explained that I knew Barker, who always treated this book as a joke, as did James Moseley, who according to the book was one of the victims of the MIBs' "silencing." (Moseley lived for 55 years after being "silenced," and was one of the least-silent people in all of UFOdumb.) Perhaps Redfern, having found a comfortable niche in UFOlogy as the MIB-man, has become protective of his prime assets. He certainly knows his MIB lore, even the obscure stuff. Longtime UFOlogist and abduction-finder David Jacobs gave one of the most interesting talks, "Understanding the Abduction Phenomenon," which pretty closely followed his latest book, Walking Among Us. That means aliens, or specifically human-alien hybrids, which he calls hubrids. And they are literally taking over our planet, slowly and methodically. This alien enterprise, he says, probably began either in the last quarter of the 19th century, or the first quarter of the 20th. These abductions are a thing that her never happened on earth before that. Alien abductions are global, clandestine, and intergenerational - they run in families. There is no evidence that aliens have ever made contact with governments. The goal is apparently "planetary acquisition," which they are doing for their own benefit, not ours. Hubrids aged in their late teens through early 20s are moving into apartments in groups or 2, 3, or 4, although a few of them live alone. (I have seen them, too, but thought they were college students.) The aliens and their hubrids are all telepathic - if someone claims to be an alien hybrid but can't read your mind, then they're not. Since Jacobs says that this alien incursion is the "greatest existential threat" to humanity, it is extremely strange that he and his followers have made no effort at all to identify these invaders, and expose them. Jacobs says that when he begins hypnosis sessions with a new "abductee," the subject says all kinds of things that just are not true, especially in the first few sessions. Subjects often "confabulate." But after a few more hypnosis sessions, Jacobs' subjects apparently learn which details are 'correct' and which are not, and tell stories that are much more 'correct.' This conformity among accounts is then cited to "prove" that the abduction stories are real.